How Engineering Experts can Create a Clear Picture for Juries - CED Technologies, Inc. 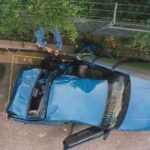 The legal system relies on forensic engineers to provide opinions that distinguish the proximate or direct cause of accidents from intervening or contributing causes. In the following case example, CED employed a tool developed in the field of failure mode analysis to distinguish these causes and to make the issues clear for a jury. In this case, Dr. Marc Zupan was investigating a swim platform failure on a recreational boat. The CED initial investigation included review of depositions, boat maintenance records, the manufacturer’s installation instructions and owner’s manual, and the complaint and pleadings in the suit. Next, CED engineers conducted an inspection of the boat and equipment that failed. Inspection revealed. that the platform failed at a fastened joint, but the cause was not evident from physical inspection alone. The next step in the process was to build a failure mode analysis diagram and designate possible causes. In any product liability case, the manufacturer is liable for defects in design or manufacturing. Design includes material selection. All the design materials in this product were corrosion-resistant stainless steels. Using microscopic analysis, it was found that the original stainless steel fastener at the location of product failure had been replaced in service by an aluminum fastener. The combination of the aluminum fastener and stainless steel substrate in a marine environment led to galvanic coupling corrosion, and the eventual failure of the product. In conclusion, the engineers used their CED approach to develop failure path analysis and demonstrative evidence (chart and metallographic pictures) that could be used to secure a favorable settlement or to help the judge and jury accurately assign liability for the accident.